David Cronenberg's Eastern Promises shares many similarities with his earlier film, A History of Violence: a steely Viggo Mortensen as anti-hero, organized crime, super-blunt ultra-violence and a straightforward, slightly pulpy story with the lightest sprinkling of sardonic wit. 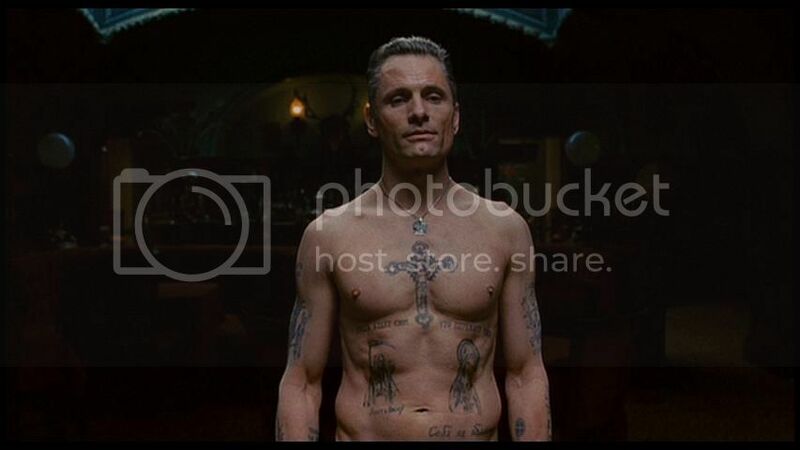 The most unique aspect of Eastern Promises is its look at the Russian mob - a rarity in most Hollywood films. Also, this, coupled with its setting of modern-day London, gave the movie a serious Graham Greene vibes. Yay Graham Greene! 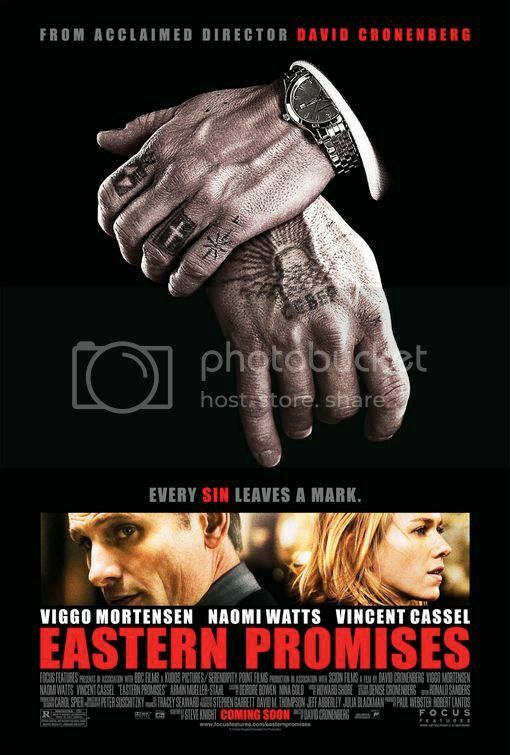 Tattoos are a big thing in the film (and in the Russian mafia, apparently). The relatively archetypal plot centers around Anna Khitorva (Naomi Watts), a midwife at London's hard knocks Trafalgar Hospital. One evening, she delivers the baby daughter of a 14-year-old heroin addict. When the mother dies, leaving Anna her Russian diary, we accompany Anna as she follows the diary's trail straight into the Russian criminal underworld. 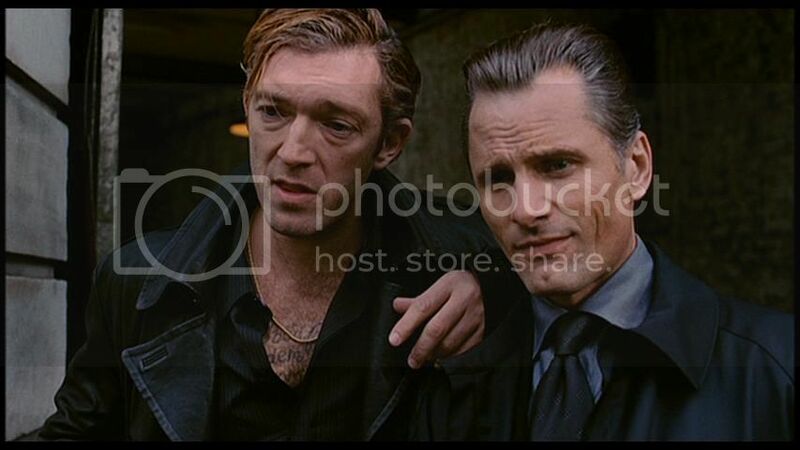 There, we meet patriarch Semyon (Armin Mueller-Stahl, of Shine), who is all cuddly teady bear on the outside, scary mob boss on the inside, his wastrel son, Kirill (Vincent Cassel), and his wastrel son's stoic buddy/driver, Nikolai (The Viggo). Some sparks fly, a lot of vodka flows and much blood is spilled. We can't quite pinpoint what we enjoyed so much about Eastern Promises (much as we can't pinpoint what we liked about A History of Violence). Neither film is our "type" - violent crime dramas with a cynical bent. Yet there's just something about them - a lack of heaviness, a clarity of aesthetic - which is very appealing. Both also feature incredibly shocking scenes of violence; shocking because it is both mundanely portrayed and chillingly grisly. We thought nothing could beat the crazy stunts of (the very aptly-named) A History of Violence, but Eastern Promises features an intense, over-the-top fight in a public bath which had us - unexpectedly - laughing out loud. Goodness me! Vincent Cassel and the Viggo - quite a pair. The performances are all fairly straightforward - with the always-fascinating Viggo Mortensen getting to display, yet again, his hefty skills in language (Russian! ), grit (public bath stuff!) and moody humor. Mortensen's style is perfectly suited to David Cronenberg's directing. And, gosh, we love Jeff Goldblum, but can you imagine Viggo as The Fly? That would be a new brand of awesomeness. Naomi Watts is OK as Anna, though admittedly she is just a cypher through which we learn about the Russian mafia stuff. Vincent Cassel is way crazy as Kirill, but he always appeals due to his natural, weird charisma. We were particularly fond of Armin Mueller-Stahl, who has perfected that whispery, slightly sinister old man stereotype - think Richard Harris as Marcus Aurelius in Gladiator, or Michael Gambon as Dumbledore (only with extra evil). Check out that perspective! Creepy. The film has an odd touch of contextual realism, as a year before its release, former KGB agent Alexander Litvinenko passed away in a London hospital. We were convinced this would have some bearing on the film... but, well, it doesn't. Nonetheless, relevant or irrelevant, this film is smart, fun and provocative. Beware - it definitely earned its R rating - but, if you can take some very gory moments (or do as we do and cover your eyes! ), it's a rewarding watch. Cronenberg is one of my favorite directors and I love his last two films. Yes, Viggo (an actor I don't usually care for) is excellent with Cronenberg. You are right about the aesthetic and the composition. 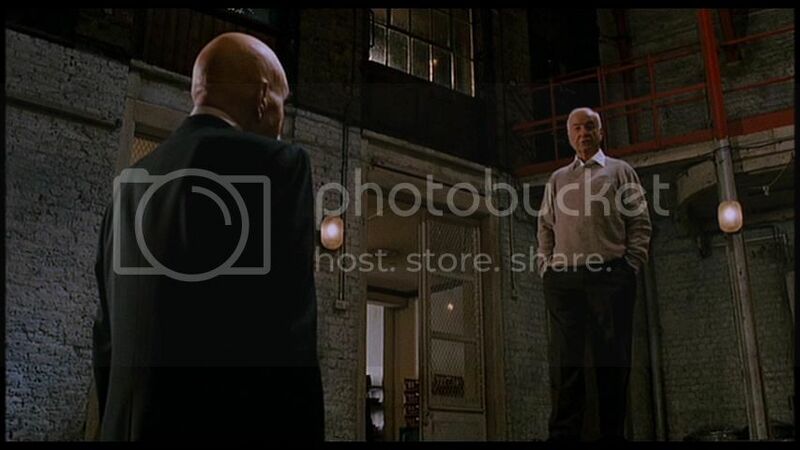 I also like his clean and uncluttered cinematography.